Consulting Pro is a library for Business Consulting & Corporate Finance with predefined web elements which helps you to build your own site. 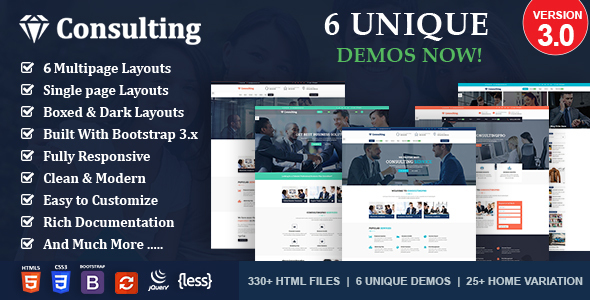 Consulting Pro template has a fully responsive layout. It fits perfectly on various displays and resolutions from regular desktop screens to tablets, iPads, iPhones and small mobile devices. - Added: 5 new Multipage Layouts. - Added: 1 new SinglePage Layouts. - Added: 1 Boxed and dark Layouts. - Added: 60 Shortcode Layouts. - Added: 25 Home variation. - Added: Some Important Features.